Home Anatomy and Body What Is Peristalsis? Despite its formidable sounding name, peristalsis is an action that your body performs naturally everyday. This activity is done through muscle contractions within your throat. Once you swallow food, the muscles in your throat contract and release so that the food is pushed further into digestive tract. Although this process is done entirely involuntarily, it is extremely important for your body to function. In essence, peristalsis is a combination of muscle contractions and relaxations that occur in your body. When it happens in your intestines, this action allows waste and food products to move through the body. Depending on your health and what you have consumed, it may even be possible to feel this activity take place. The large intestines are one of the easier portions of the body to feel peristalsis. 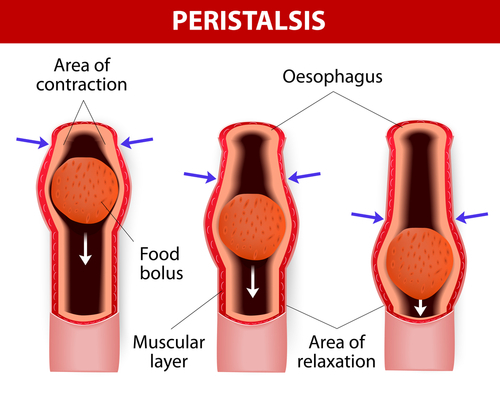 Through peristalsis, your body sends food through your digestive system. It helps bile to move from the gallbladder to the duodenum. In addition, peristalsis works to move urine from the kidney to the bladder. When you pass gas, you are basically feeling peristalsis in action. Obviously, your food and liquids cannot just remain in your stomach. Once they have arrived in the stomach, acids help to break up the food so that it is ready for transit. The stomach pushes the partially digested food out of the stomach and into the intestines. Your food’s next stop is in the small intestine. During this portion of the journey, gas is removed from the mixture to prevent it from building up. Smaller contractions occur in the smaller intestines to move the food through. Once the food reaches the large intestine, two or three cycles of peristalsis move the waste products along. At the end of this journey, the waste is prepared to be excreted from your body.